High quality new yarn large storage bag, embroidery sewing crochet holder, DIY tool is suitable for your choice. Wool crochet tool pouch,clothes storage bag. Material: Oxford Cloth. Only storage bag is included, not include hooks, wool, etc. A small ball or crepe can be placed with small holes on it for quick and easy, and can be easily thrown into a wallet, car or sofa, and still remain intact. Oxford cloth material, the bag is of good quality and the fabric is very strong. Material: Carbonized bamboo. These knitting needles are supplied with wide sizes ranging from 3mm to 10mm, which will fulfill your varied knitting needs. 22 knitting needles 1 pink flower pouch. Perfectly round sharp point for a smooth knitting right from the start. 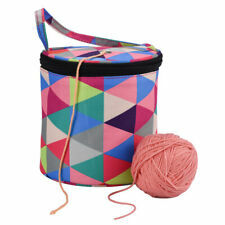 A classic knitting pin storage bag that will comfortably hold knitting needles up to 42cm (17"). Barnyarns is based in the Cathedral city of Ripon in North Yorkshire. 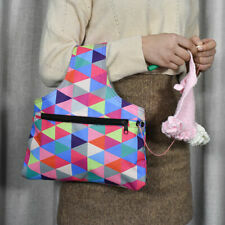 Knitting Pin Bag. Quilting, Embroidery & Sewing Accessories. It is a perfect gift for knitting lover or crochet learner. 9 X lace crochet. Needle Size includes: 2mm, 2.5mm, 3mm, 3.5mm, 4mm, 4.5mm, 5mm, 5.5mm, 6mm, 7mm, 8mm. 18 X Stitch Makers （random color）. 1 X Row Counter. ARTBIN KNITTING NEEDLE / HOOK CASE. Holds instructions and supplies for knitting, crocheting. any instructional project. Elasticated stitched slots for knitting needles, crochet hooks, rulers, scissors etc. vintage knitting needle bag. Vintage fabric design is contemporary shapes in navy orange and mustard on a cream background. Wooden handles with flower heads painted on the bag. Lined throughout. Some threads are pulled. As photo shows. Measures 15” down and 16” across approx.Condition is Used. Dispatched with Royal Mail 2nd Class. The bag is unlined and has a white silk cord drawstring with tassle detail.This bag is slightly longer and wider than the other knitting needle bags I have on for sale, so therefore it will hold a few more knitting needles. Crochet Hook Bag 1 (without accessories, just an empty bag). Made of high-quality nylon, the crochet hook bag enjoys strong and smooth zipper. Unfolding size: 54 19.5cm/ 21.26 7.68". Hillington All-In-One Knitting Bag - This yarn storage bag can organize your yarn and all of your knitting accessories in one bag and can keep them separated any time,whethe you are knitting or not.It is a wonderful gift for knitting enthusiasts and beginners. Fit Different Accessories - Many pockets are designed to fit the different accessories.The Spare yarn/wool,unfinished project,skeins of yarn,crochet hooks,knitting needles are organized methodically.It's very easy to find and use them.